Toys have a way of taking over. It starts innocently enough. You love your kids. You want to make them happy. But before you know it, you find yourself standing ​knee-deep in discarded Legos and naked Barbie dolls. The kids are bored; the house is a mess, and no one is happy. Sound familiar? You’re not alone. Most families have too many toys. But what many well-meaning parents don’t understand is, in reality, more toys equals less play. Kids are easily overwhelmed with choice, and a child who is unsure of what to play with often ends up playing with nothing at all. But the problem is even more fundamental than that. Our culture’s obsession with flashy plastic junk has taught our children to be passive participants in play. Instead of playing with their toys, they expect to be amused by their toys. And they are… for about five seconds. Then it’s back to the toy box, or more aptly, the floor. Parents: There’s a better way. More and more families are taking the minimalist approach to toys, cutting back on the clutter and focusing on quality over quantity. Want to join their growing ranks? Take back your toy room with these six play-enhancing tips. If you’re going to take control of your toy situation, you’re going to have to get rid of some toys. Start by digging out and boxing up any toys that your kids have outgrown. If your child is already reading, it may be time to pass those alphabet and phonics toys on to someone else. Still holding on to those rattles and teethers? Time to let go. If it’s no longer developmentally appropriate for your child, it no longer deserves a place in your home. Multiples are another obvious offender. If you have three versions of Memory featuring three different characters, pick a favorite and move on. Finally, toss the junk. Broken toys, puzzles and games with missing pieces, Happy Meal prizes, party favors—just trash it! Once you’ve pared your collection down to things your kids might actually play with, it’s time to think about what they actually like. Kids tend to play with the same toys regularly. Sure, they may pick up other toys in passing, but they always come back to their favorites. Ask yourself the hard questions: how many dolls do you really need? How many car toys? Be ruthless. If it’s not one of your kiddo’s go-to toys, let it go. When kids can’t see their toys, they don’t play with them. Sick of your kids pulling out every last toy just to leave them lying all over the floor? Why not leave them out in the first place. Instead of stuffing toys into baskets and bins, try organizing your little one’s things into several themed play stations where toys remain largely on display. For instance, you might have a costume station with a hanging rack of dress-up clothes and a mirror, or a domestic play station with a toy kitchen and a basket of toy food. Set up a table with art supplies and building toys and a reading corner with a comfy chair and some books. While it’s important to allow creative cross play, you should encourage your children to clean up each station before moving to another. 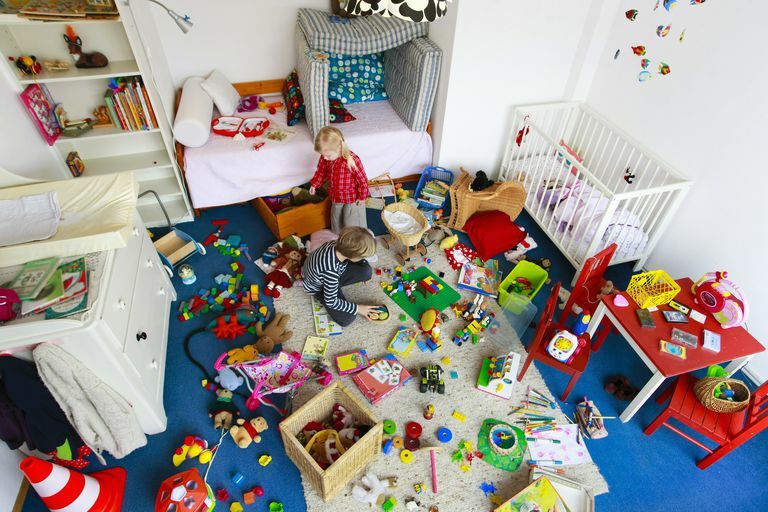 Your child will have a much easier time deciding what to play with, and you’ll find it much easier to keep up with the mess. Playing with the same toys over and over again can get tiring after a while. Wondering how to keep your kiddos engaged? Try mixing things up a little. A well-organized toy rotation helps to eliminate clutter while allowing children to play with a wider selection of toys. Since the available toys change on a regular basis, there is always something new and exciting to play with, ensuring your child will never get bored. Worried your little one will miss their favorite things? There’s nothing wrong with leaving a few toys, like Legos or a much-loved stuffed animal or doll, out on a permanent basis. And if your kids are happy with the toys they currently have, it doesn’t hurt to alter your rotation schedule. As long as your child is happy and engaged, there’s no need to stress. What’s the point of having an extensive library of children’s books if your kids never read them? Bookshelves are often difficult for little ones to access on their own, and with so many books to choose from, it’s hard to know what to pick. If you want to encourage your kids to read, try trading traditional bookshelves for a few easy-to-access book rails. Book rails hold fewer books and display their covers better, making them more attractive to kids. Make sure your child can see and reach the books, and change the titles often to continually peak their interest. You can even make weekly trips to the library and have your kiddo choose and set up their own books. Another way to head off the avalanche of unwanted junk that looms every December is to make a gift list for your family. Holiday shopping can be a struggle, and many people appreciate having a few solid gift ideas for things they know you’ll love. Making a gift list also give you the opportunity to offer creative alternatives. Have a local attraction you love or a favorite family ice cream parlor? Ask for gift certificates! Your relatives may enjoy the idea of funding a fun family outing, especially if you take the time to give them a call and let them know how much you loved it. Toys are meant to be tools, not entertainment centers. Instead of buying your kids flashy plastic junk, look for toys that encourage creative thinking, teamwork, and imaginative play. Bricks, blocks and other building toys are excellent creative fodder for growing minds, and games are perfect for teaching children teamwork and good sportsmanship. Role-playing toys, such as costumes and dollhouses, fire up the imagination and help children to enhance their social and emotional skills. If you have the space, consider investing in a couple of large toys that set the stage for pretend play. A simple teepee or toy kitchen with just a few accessories can provide hours of entertainment, transporting your little one to that development-rich land of make-believe on a daily basis.